When it comes to product lifecycle management, Ballard is at the leading edge of innovation in applying the three “Rs” to its fuel cell stacks. Our expertise in Refurbishing, Reusing, and Reclaiming fuel cell components means our solution is both zero-emission and zero-waste. And that’s good news for any large fleet owner looking for a truly sustainable and cost effective solution. Whether you’re a transit operator, or you work in the commercial delivery, material handling, or trucking industries, Ballard is committed to saving you money, keeping materials out of the landfill, and helping you with your service strategy. How do we do it? One word: Refurbishment. Let’s take a closer look at what happens to a fuel cell stack when it reaches the end of its life. 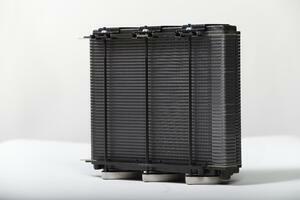 What is Fuel Cell Refurbishment? Fuel cells typically have lifespans of five to ten years, depending on the application. At that point, the membrane electrode assembly (MEA) wears out. But that doesn’t mean the fuel cell needs to be thrown away. With Ballard’s leading MEA and plate technology, we can refurbish the fuel cell stack, putting in the latest MEA technology and reusing the plates and hardware. With the latest MEA and a fresh set of seals, we return the product to the original user. These refurbished fuel cells meet the same specification as a new stack, but are built at a fraction of the cost. Furthermore, we then send the MEA to another facility to reclaim the platinum where approximately 95% of the platinum can be reclaimed. This platinum is then available for use in another product. The result is total life cycle management. In contrast, the lithium ion batteries used in battery electric vehicles are not able to be refurbished in this way. Once a battery hits the end of life, that’s it. 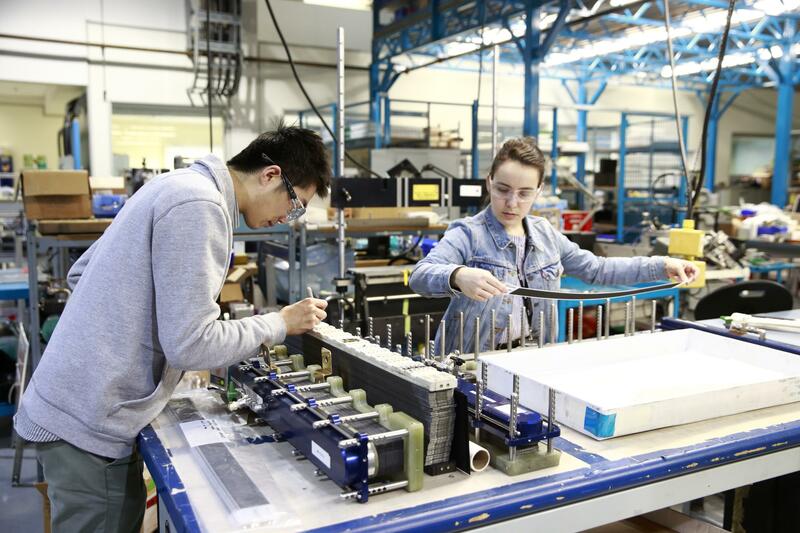 To date, Ballard has delivered over 30,000 fuel cell stacks for bus, material handling, and backup power systems to forward-thinking large fleet operators around the world. We are now refurbishing thousands of stacks every year. This creates a win-win situation for both our customers, and the environment. Ballard’s internal systems are ISO 14001 certified, and will soon be IATF 16949 certified. Ballard’s systems are also based on continual improvement. This includes the processes that we use to refurbish, reuse, and reclaim our fuel cell stack platinum. We’re proud to announce that a new project is underway that will lower the environmental impact of our platinum reclamation process. Another project will include the full life cycle analysis of all products in the Ballard line. Not only do hydrogen fuel cells provide a compelling zero-emission alternative to conventionally-powered vehicles, they also have the added benefit of being zero-waste. Ballard’s ability to reclaim 95% of the fuel cell stack means far fewer toxic chemicals and waste products end up in landfills. As we move together into a cleaner, more environmentally-friendly future, let’s ensure sustainability across the entire lifecycle of the products we create. Our future generations will thank us. 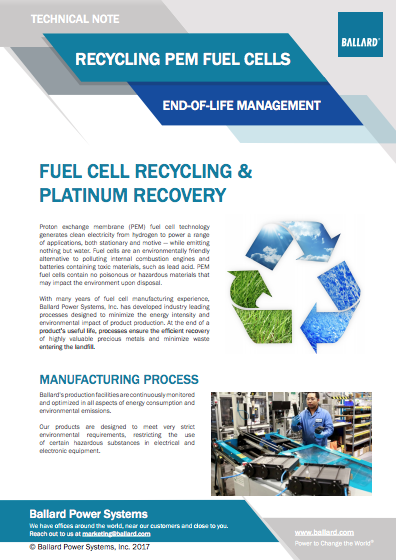 Download this free technical note to learn more about fuel cell recycling and refurbishment.